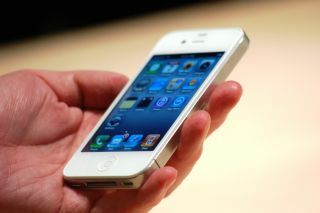 In the worst kept secret in technology, the white iPhone 4 officially lands in the UK and worldwide tomorrow, 28 April. In a statement Apple bigs up the new iPhone's beauty and thanks everyone for being patient - they obviously haven't read any of the fanboy rants. "The white iPhone 4 has finally arrived and it's beautiful," said Philip Schiller, Apple's senior vice president of Worldwide Product Marketing. "We appreciate everyone who has waited patiently while we've worked to get every detail right." Update: The long awaited white handset will also be available from Three.co.uk and Three stores tomorrow morning. You can nab it on a 24-month contract starting from £25 a month, or on Three's One Plan for £35 a month, including all-you-can-eat data, 2,000 any network minutes, 5,000 Three to Three minutes and 5,000 texts. If you're interested in pay as you go, Three is offering the iPhone 4 for £499.99 where a £15 top up will get you 300 minutes, 3000 texts and all-you-can-eat data. Considering "every detail" constitutes a colour change, we are not quite sure why it has taken so long for Apple to give us a white iPhone 4 but we are glad it is finally making its way to the UK this week. Apple has offered up dollar pricing for the white iPhone 4, stating that the 16GB model will retail for $199 and it's $299 for the 32GB. With talk of the iPhone 5 and iPhone 4S making an appearance before the year is up, it seems a little funny to still be talking about the iPhone 4 - especially considering Samsung has already released its iPhone 4 killer, the Samsung Galaxy S2 - but it's bound to be lapped up by colour-conscious Apple fans.